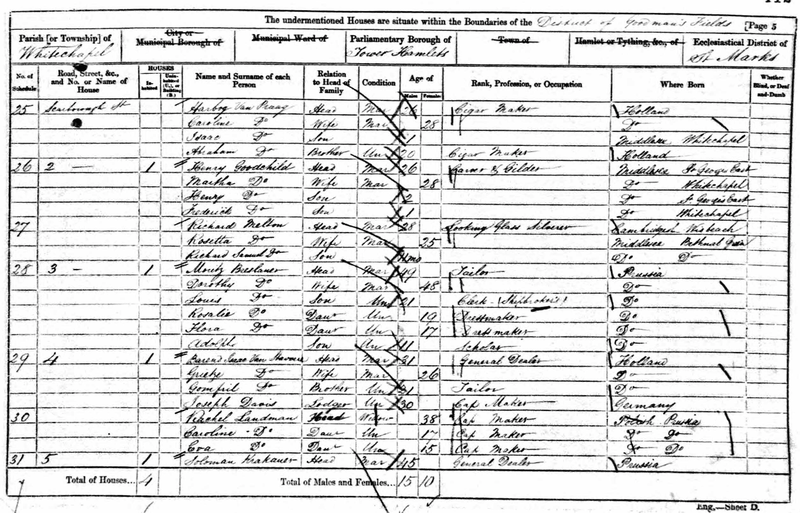 Theresa Reis was born on 4 March 1853 at 5 Chatsworth Street, Liverpool, the daughter of Jonas and Marian (Samuel) Reis. 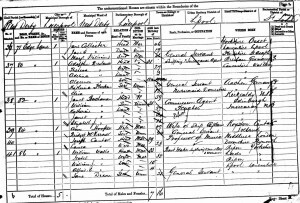 She married Adolphus/Adolphe Breslauer on 15 May 1877 at Liverpool Old Hebrew Congregation, Liverpool. The marriage took place very shortly after her father’s death, only a matter of about 6 or 7 weeks. 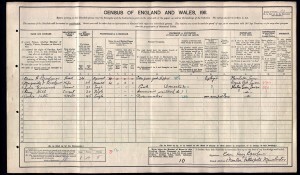 She died on 11 March 1933, age 80 at 23B Lexham Gardens, Kensington, London. 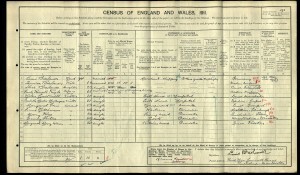 Adolphus was born in 1849 in Germany and he died in 1926 at Bournemouth, Dorset. Some name changing appears to have gone: Theresa refers to herself in her will as ‘Theresa Breslauer known as Theresa Stanley of No 16 Westgate Terrace, Redcliffe Square, London’. Her son Reginald changed his name from Breslauer to Stanley, so she must have followed. This probably was a result of her divorce from Adolphe. 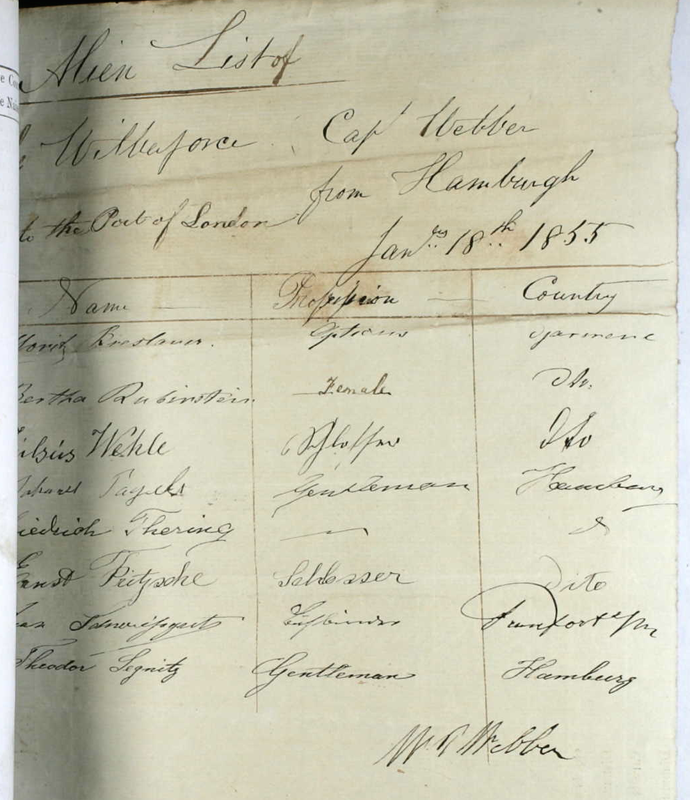 The probate notice it states that, although she died at Lexham Gardens, she was ‘formerly of 16 Westgate Terrace….’. Notes on the Breslauer family. 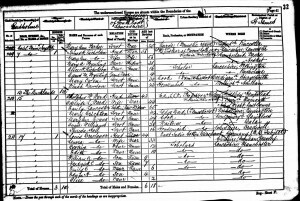 Adolph was born in 1850 in Germany and at the age of 5 emigrated with his father Moritz, mother Dorothy, and the rest of his family. 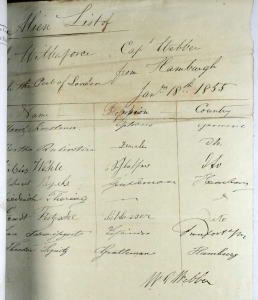 The ‘Alien List’ below dated 18 January 1855 shows Moritz on the first line. 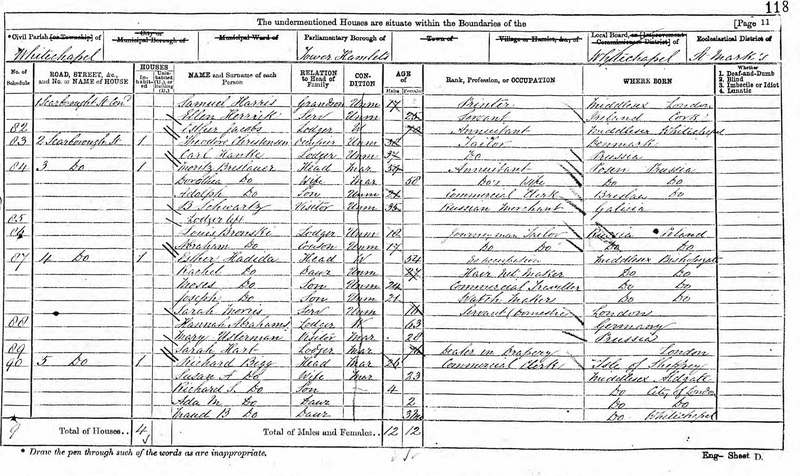 1871 Census the Breslauer family is still living at Whitechapel and Moritz’s place of birth is given as Posen in Preußen [Prussia]. Moritz Breslauer (59); Dorothea Breslauer (58); Adolph Breslauer (21); B Schwartz (35); Louis Bronski (18); Abraham Bronski (17). 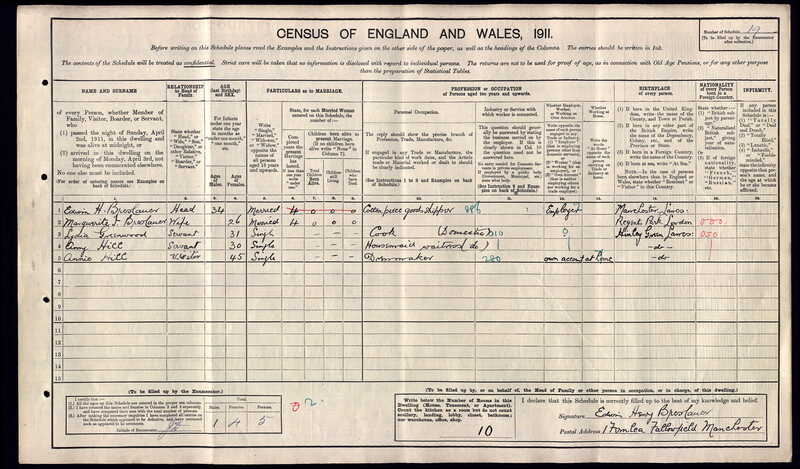 Note that on that census there appears a daughter Minnie aged 7. 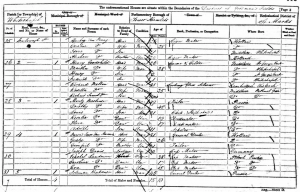 On the 1881 census (below) Minnie does not appear and it is believed that she was deceased although her death registration has yet to be found. 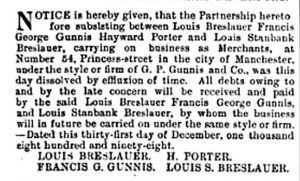 Louis became a shipbroker on his own account (Messrs. Breslauer & Co.) and launched a number of ships. Among the ships was one named Minnie Breslauer which was launched around 1872. Perhaps she was so named in memory of Louis’ deceased daughter (?). If so, misfortune followed her as the ship sank on her maiden voyage just off Bermuda and is today is a well-known site for divers to explore. A summary of the wreck’s attractions for divers is given below. 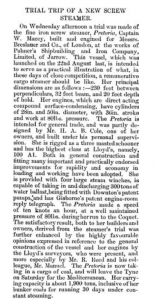 Below, an article titled Trial Trip of a New Screw Steamer. 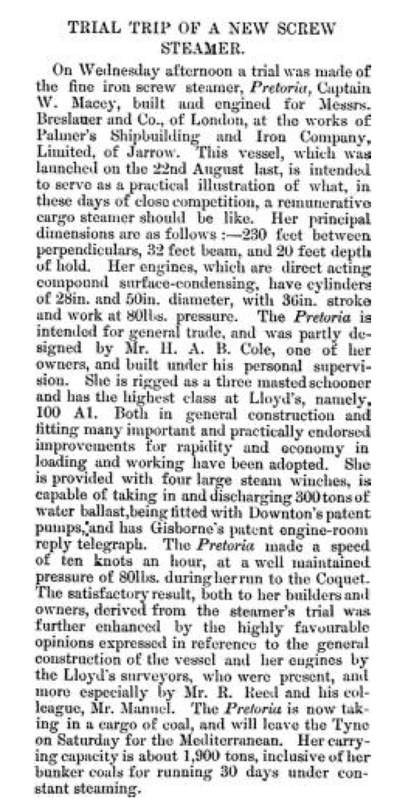 The Star (Saint Peter Port, England),Saturday, October 06, 1877; Issue 50. The following is from Investors Chronicle and Money Market Review, Volume 29, 21 November 1874: Messrs. Breslauer and Co. notify that they purpose establishing regular steam communication between London and Alexandria (via Tunis and Malta). It is intended to send one of seven steamers set apart for the service every month, from the Millwall Docks, or oftener if the trade requires it. 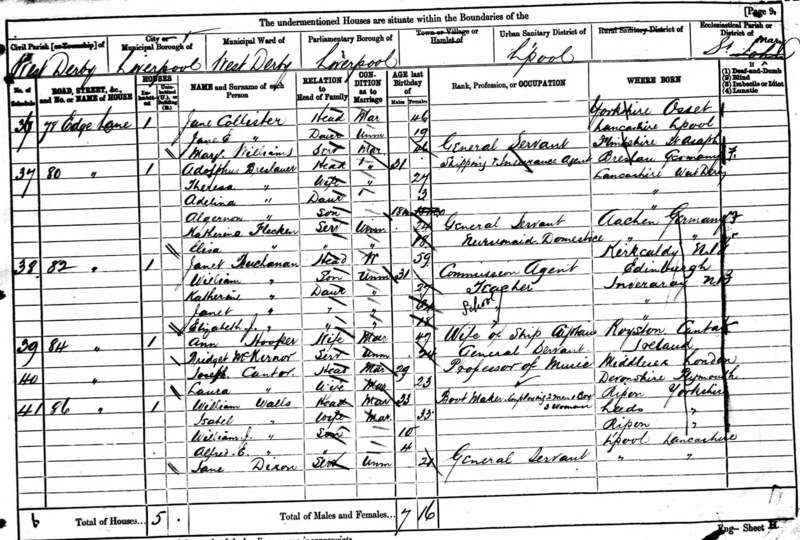 All the children were born in Manchester and the three adult sons identify their occupations as ‘Shipping Merchant’. 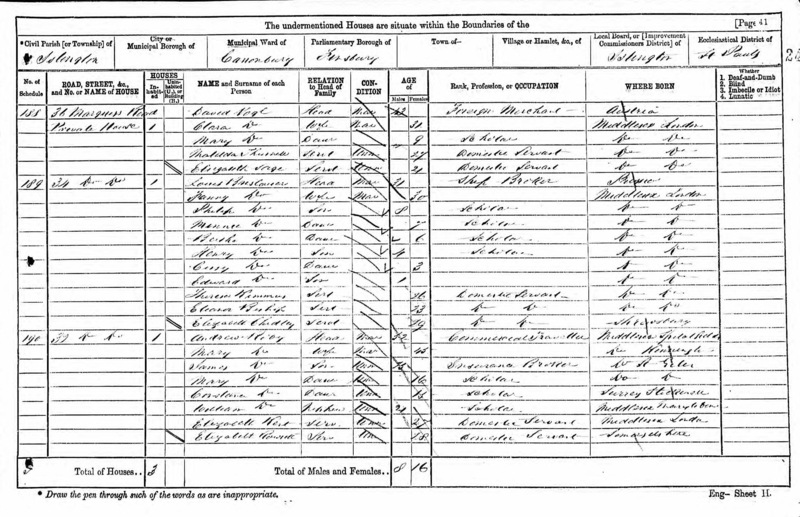 Note that Louis and his son Edwin were among the ‘chief mourners’ at the funeral of George Boustead Schwabe. It is a puzzle at this stage how the two families are connected. 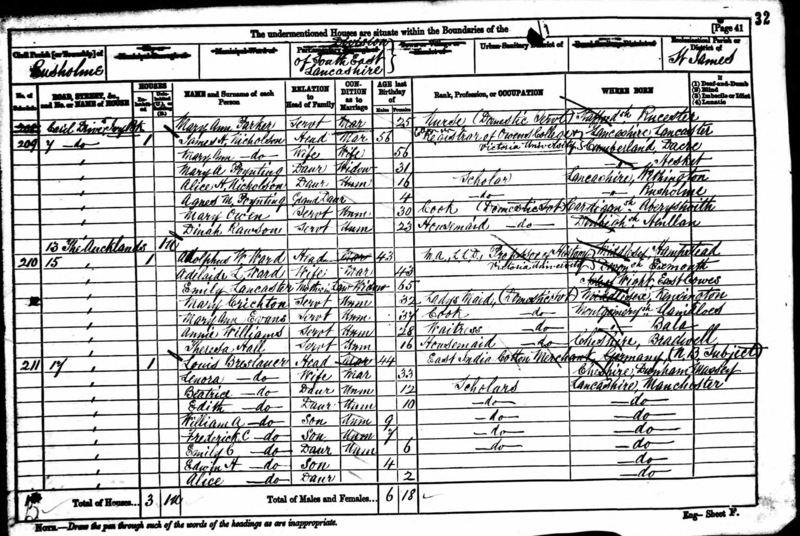 On the 1911 census Louis appears with his wife, various visitors and servants. 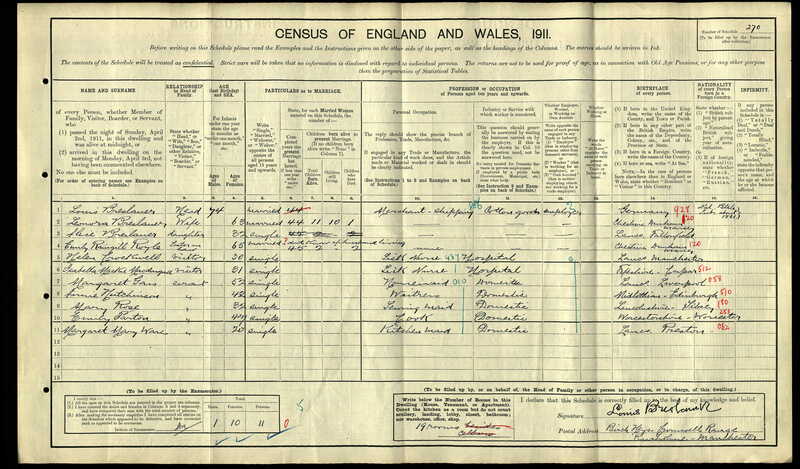 One unmarried daughter Alice remains. THIS IS THE LAST WILL AND TESTAMENT of me THERESA BRESLAUER known as Theresa Stanley of No 16 Westgate Terrace Redcliffe Square London whereby I revoke all Wills and Testamentary —dispositions by me at any time heretofore made I APPOINT my sons Algernon Norman Breslauer and Reginald Stanley (hereinafter called ‘my Trustees’) to be the Executors and Trustees of this my Will and I direct that the Solicitors to be employed by my Trustees in the proof of this my Will and the carrying out of the trusts thereof shall be Messrs A. D. & L.J.D. 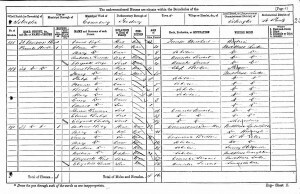 Brockman of 12 Cheriton Place Folkestone I direct my Trustees first to pay my just debts and funeral and testamentary expenses I direct my Trustees to raise and set apart such a sum as shall when invested bring in a clear yearly income of One hundred and fifty six Pounds And I direct that my Trustees shall stand possessed of the income and capital thereof Upon Trust to pay to or apply for the benefit of my son Austin Granville Breslauer the sum of Three Pounds per week during his life this bequest to be free of all duties: I give the following specific and money legacies free of legacy duty:- To the St. Georges Hospital my Schiedmayer piano in memory of my daughter Elvira Muriel to provide musical entertainment for the afflicted. To my daughter Adeline Clarinda Theresa wife of Herbert Hands of Rio de Janeiro Brazil my two paintings by Passe, one dozen heavy silver spoons, one dozen silver teaspoons, my silver soup ladle Any four water colour paintings and any other fancy pictures she may care to select except those given to my said son Algernon my Furs my household linen My Ivory handled umbrella one pair of diamond earrings enamelled with black one single stone diamond ring one gold 18 carat Bracelet with precious stones of Indian workmanship one 18 carat curb bracelet. To my son Reginald my Father’s diamond singlestone ring, one screw diamond shirt stud Plated Liquor stand and the sum of Two hundred and fifty pounds and as I consider that he is sufficiently well off I am not leaving him any share in my residuary estate hereinafter referred to I give to my said son Algernon my singlestone largest Brilliant ring my diamond Tie pin and studs Painted Portrait in Black carved wooden frame of my late daughter Elvira. Painted Portrait of my late Father Jonas Reis as a young man I give the rest of my silver and plate equally between my said daughter and my said son Algernon I give my walnut bedroom suite which I inherited from my mother to my said son Algernon. To my said daughter my ash bedroom suite large mahogany dining table. To my said son Algernon a mahogany dining table and my antique garde-de-vins small antique table and brass coal scuttle. I give the rest of my furniture and effects equally between my said daughter and my son Algernon and if they fail to agree as to any items the same shall be sold and fall into my residuary estate hereinafter referred to. I give all the rest and residue of my property of whatsoever nature and wheresoever situate including my freehold house No 16 Westgate Terrace unto my Trustees Upon Trust to sell and convert the same into money and to invest the proceeds of sale in Trustee investments and stand possessed thereof as to one half thereof to pay the income arising there from to my said daughter during her life and as to the other half part thereof to pay the income arising there from to my said son Algernon during his life and from and after my said daughter’s death Upon Trust, as to one half of my said residuary estate for all my grand-children who shall then be living in equal shares absolutely. And from and after the death of my said son Algernon as to the other half of my said Residuary estate Upon Trust for such one or more charities as my Trustees shall in their discretion select I declare that if any of my children shall dispute my Will in any way that such child shall forfeit any benefit that they should otherwise be entitled to under this my Will IN WITNESS whereof I have hereunto set my hand this sixteenth day of August One thousand nine hundred and twenty seven. Signed and acknowledged by the Testatrix the above named Theresa Breslauer known as Theresa Stanley as her last Will and Testament in the presence of us both being present at the same time who at her request in her presence and in the presence of each other have hereunto subscribed our names as attesting witnesses. Thos. Kent Tupholme, 1 Coleherne Terrace, Earls Court, S.W. 5 Chemist. 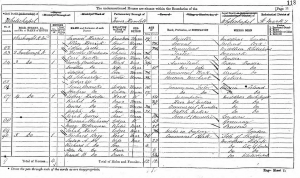 THIS IS A CODICIL to the Will of me Theresa Breslauer known as Theresa Stanley which Will bears the date the Sixteenth day of August Nineteen hundred and twenty seven I give to my grandson Kenneth Stanley the sum of Five Pounds free of duty and to my Granddaughter Nita Stanley my curb gold bracelet and a ring to be selected by my Trustees. And in all other respects I confirm my said Will IN WITNESS whereof I have hereunto set my hand this Sixteenth day of August Nineteen hundred and twenty seven. Signed as and for a Codicil to the Will of the said Theresa Breslauer known as Theresa Stanley in the presence of us both being present at the same time who at her request in her presence and in the presence of us each other have hereunto subscribed our names as Witnesses. R.C.Z. Drake. Brockman, Folkestone, Kent, Solicitor and Notary. A SHORT HISTORY OF THE STEAM SHIP MINNIE BRESLAUER. 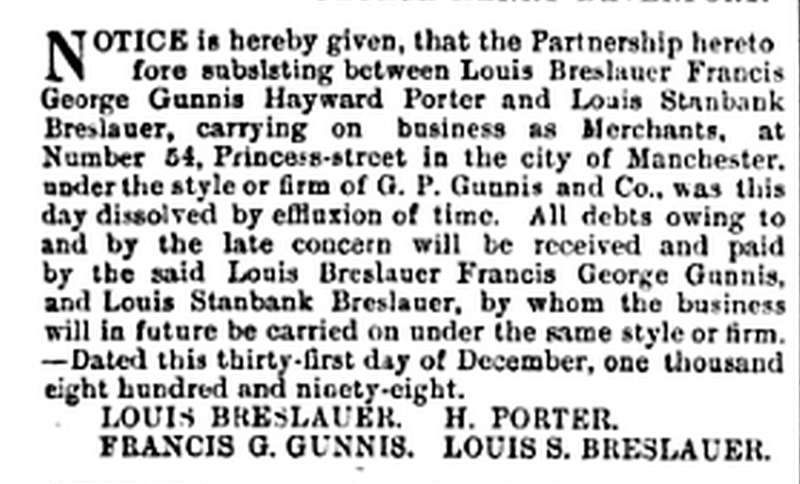 The Minnie Breslauer was probably named after Louis’ daughter by the same name. She was 300 foot steel hulled freighter. In January 1873 The Minnie Breslauer sank on it’s maiden voyage out of Malaga..
….. was on her maiden voyage sailing between Portugal and New York, loaded with a cargo of wine, dried fruit, bales of cork and an unspecified quantity of lead in 160lbs. Ingots. On January 1st 1873, and unfamiliar with Bermuda’s reefs, the Captain edged his new charge towards the shore, where she probably collided with South west Breaker, her momentum carrier her to a point just off the South Shore beaches off Warwick where she ground to a halt. An attempt was made to rescue her, but this only resulted in her sinking. The wreck now lies in about 65 feet of water pointing away from land and shallow water which makes it appear she must have reversed onto the reef, unless of course you remember she didn’t sink until during an attempted rescue. The bow lies on the reef, pointing out to sea in about 40 feet of water.